In a world of over-visited tourist attractions, a smart traveler’s bucket list is malleable and changing often. More travelers than ever are swapping busy Rome for Amman, Mexico for Colombia, and Thailand for Vietnam—opting to see the path less-traveled before the crowds find them. Plus, new access and affordability like emerging air routes can also shake up your travel priorities—how many people went to Iceland before WOW air launched its budget flights? Last year I shared the unexpected places that had moved up on my bucket list, and now there are even more new destinations to uncover. Newly accessible and affordable for Americans, Brazil recently began offering eVisas online for about $40—a big change from the $160 fee and in-person appointment that were previously required. And airlines are following suit: Chilean carrier LATAMand new budget airline Air Italy both now offer flights to Brazil, with Sao Paulo being the main hub for LATAM (and pretty much all U.S.-based airlines). And while Brazil might make you think of rainforests and Rio beaches, an introduction to Brazil should begin in its concrete jungle: Sao Paulo. The largest city in South America, Sao Paulo offers affordable luxury thanks to an advantageous exchange rate for Americans that turns Michelin-star restaurants and shopping on fashionable Oscar Freire Street into bargain experiences. Sao Paulo is famously international, from the Japanese sushi in Liberdade and the Italian food in Bela Vista—but you can also get a hearty helping of Brazilian food in at a churrascaria or buffet. Nearby beaches like Praia Grande are only a couple of hours away for a change of pace on a day trip, but spoiling yourself in Sao Paulo can easily be the main event of your first visit to Brazil. Where to Stay: Located in Sao Paulo’s trendy Jardins neighborhood, the high-end Renaissance Sao Paulo Hotel has sprawling views of Sao Paulo’s endless skyline. Upgrade to a roomy business suite to lock down a sky-high view, and for added access to a sleek lounge serving unlimited hors d’oeuvres and bar specialties on the top floor. If you’ve never heard of the “Venice of China,” Suzhou is about to take over your day dreams. This city of 10 million is accessible via bullet train from Shanghai, but it looks a world away. Bridged canals and manicured gardens meld Chinese cultural icons (think temples and pagodas) with Venetian-style waterways. Cruise the Suzhou Ancient Grand Canal on a sightseeing ship, or take a rickshaw-style boat ride for a more intimate guided experience. Where to Stay: Affordable China is the perfect place to get a lot of luxury for a crazy-affordable hotel. Hotel Soul Suzhou has sleek, modern interiors that will break up the pattern of the city’s traditional gardens and architecture for just $50 per night. If Wyoming seems like an underwhelming spot for bucket list, you’ve probably never considered Yellowstone-adjacent Jackson Hole. The forest-nestled valley is on the rise after recent recognition from big-name artists like Kanye West, who made it his newest recording location. Its reputation has been updated from winter ski town to opulent year-round relaxation getaway. Dubbed by Vogue as the Serengeti of North America for safari-style glamping and wildlife safaris, Jackson Hole also offers hot-air balloon adventures, fine dining, hot springs, and a burgeoning collection of art galleries for equal parts family-fun and romance options. Where to Stay: Hotel Terra Jackson Hole is a favorite for its spa, infinity pool, frontiersman-inspired glam interiors, and a fine dining restaurant with a pizza oven and impressive wine bar. Europe’s most hidden gems are rising in popularity thanks to over-tourism in Western Europe hotspots like Barcelona and Venice, but there are still plenty of new destinations tourists haven’t overtaken quite yet. For a unique European getaway that will take your back in time to the Middle Ages, opt for Estonia’s colorful old towns, medieval castles, and surprising array of national parks. The capital of Tallinn exudes the charms of Russia with a Western European touch, and is a favorite stop on Viking Ocean Cruises that include the Baltic Sea. Where to Stay: If you’re more of a landlubber than a cruiser, stay a while in one of Tallinn’s surprisingly affordable five-star hotels. Hotel Telegraaf puts visitors in the city center (and the lap of luxury) for under $200 per night. Singapore has moved up on many a bucket list as a new destination thanks to the Crazy Rich Asians movie, but you might not have the island state’s tiny Bawah Reserve on your radar just yet. Located off the coast of Singapore, the Bawah Reserve is made up of six private islands that string together a rare ecosystem of lagoons, beaches, coral reefs, and private overwater bungalows. The reserve has only been open to tourists since 2012 when this part of the Anambas Archipelago was transformed into a secluded sustainability retreat. Where to Stay: The Bawah Island Resort’s 35 luxury suites attract adventure travelers with a taste for the finer things and extreme privacy. Upscale dining, a spa, and private swim decks make it a worthy alternative to busy Bali—but be prepared to pay just as much, if not more. Jordan is having a moment for its hiking trails and the worldwide appeal of Petra, one of the New Seven Wonders of the World—but it’s capital, Amman, is equally deserving of a visit. Easily doable in a weekend before heading south to take a dip in the Dead Sea and explore the ancient ruins of this small desert nation, you can hit up Amman’s world-class museums, Roman amphitheater and citadel, art cafes, and shawarma shops for an affordable cultural getaway. Walking and cheap taxis will easily allow you to see everything, from mosques and ruins to trendy Rainbow Street eateries and a beloved Jordanian microbrewery, Carakale Brewing, for tasty craft beer and far-flung views of the surrounding biblical landscape. Where to Stay: Affordability is the name of the game in central Amman. There are small hotels and boutique hotels from $40 nightly, plus larger, comfortable options like The Boulevard Arjaan by Rotana for as little as $130 per night. If you’re dreaming of getting to the Antarctic without spending thousands on a polar cruise, simply hopping a flight to the tip of South America could soon be the best way to make it a reality. Travelers looking for a hiking paradise even more remote than Patagonia might soon be able to fly to the Falkland Islands thanks to emerging demand for a new air route to the Archipelago: LATAM was just named by the local government the “preferred operator” for the prospect of new weekly flights to the islands. With the Chilean airline already expanding across South America in 2019, it seems we’ll soon be closer than ever to spotting penguins in their natural habitat. Where to Stay: Once you’re there, hotels like Malvina House Hotel, located near the Falkand Islands Museum and a sprinkling of restaurants, are far and few. 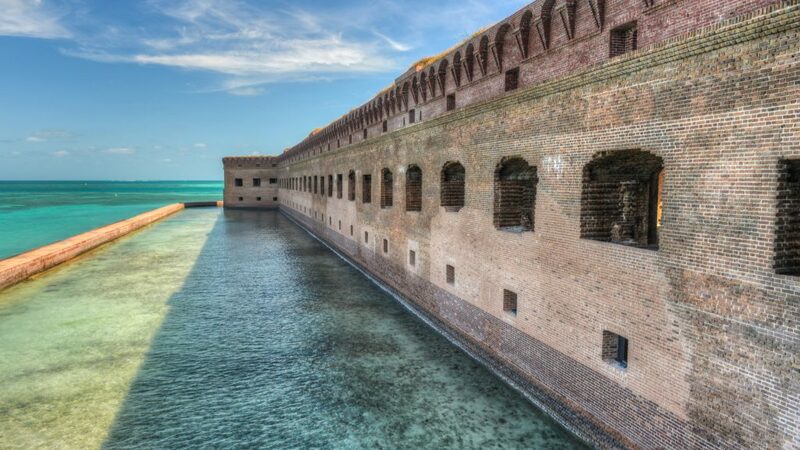 A bucket list spot you’ll want to see before it disappears, Dry Tortugas National Park sits 70 miles west of Key West, Florida, and is a piece of military history floating in the middle of the Gulf of Mexico’s rising sea waters. The hexagonal fortress that sits on tiny Dry Tortugas island is deteriorating from weather, storm damage, and lack of maintenance—but its brick interior can still be toured today. The white sand beaches of Dry Tortugas are a popular for snorkeling, camping, and scuba diving. You can also walk the seawalls of the fort, which will put you right over the shallow turquoise waters. Where to Stay: You’ll have to stay on or near Key West to access this isolated island on a Dry Tortugas day-trip tour that requires a two-hour boat ride.